The river enters Illinois where it widens into a large area of interconnected lakes known as the Chain O'Lakes. Fox Lake is the largest city in this area. 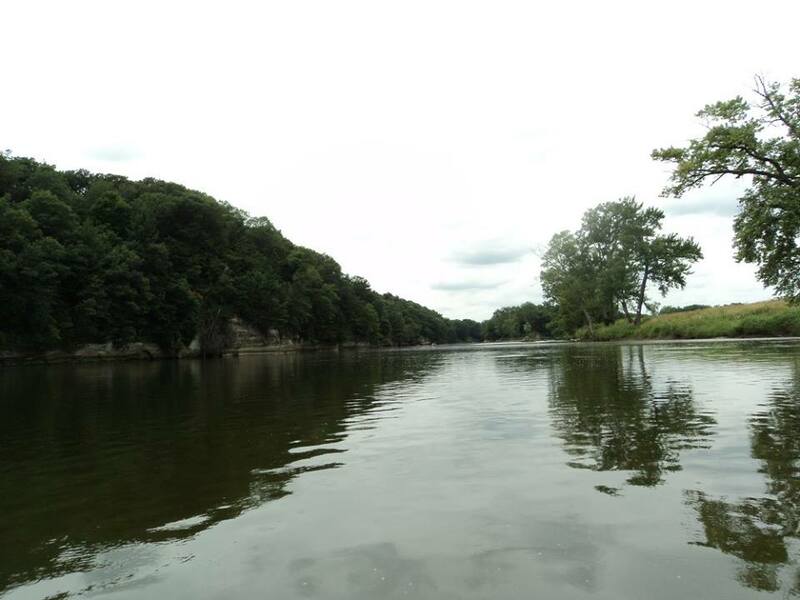 From the chain, the river flows generally southward for 118 miles, until it joins the Illinois River at Ottawa. Illinois towns and communities that are on the Fox River include (from north to south) Johnsburg, McHenry, Holiday Hills, Island Lake, Burton's Bridge, Port Barrington, Cary, Fox River Grove, Algonquin, Carpentersville, West Dundee, East Dundee, Elgin, South Elgin, St. Charles, Geneva, Batavia, North Aurora, Aurora, Montgomery, Oswego, Yorkville, Plano, Millington, Sheridan, Dayton and Ottawa. Collectively, the area surrounding the Fox River is known as the Fox Valley. Around 1 million people live in this area. 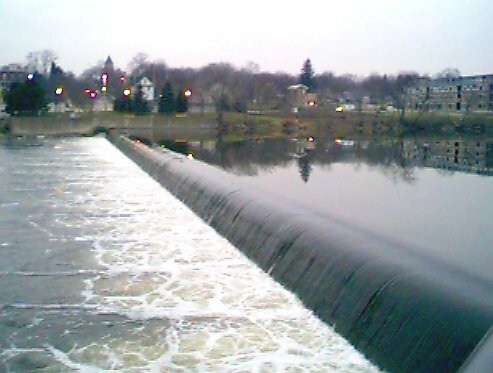 The Fox River has 15 dams, including McHenry Dam, which raises the river slightly to maintain depth in the Chain O'Lakes in northern Illinois, and a hydroelectric dam near Ottawa. In the winter, bald eagles can be found nesting along the banks. Early in the history of Illinois, the Fox River provided water for the Illinois and Michigan Canal via a feeder canal, allowing the canal to pass over the Fox River on an aqueduct. 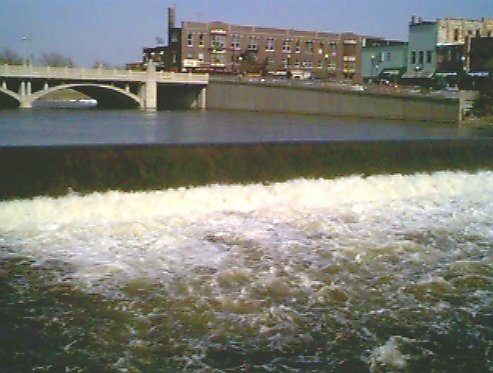 The Fox river can flow between 2 and 6 MPH, depending on location and time of year. The gradient averages about 3 feet. The river flows a bit slower up north by all of the dams, but then picks up pace south of Aurora. 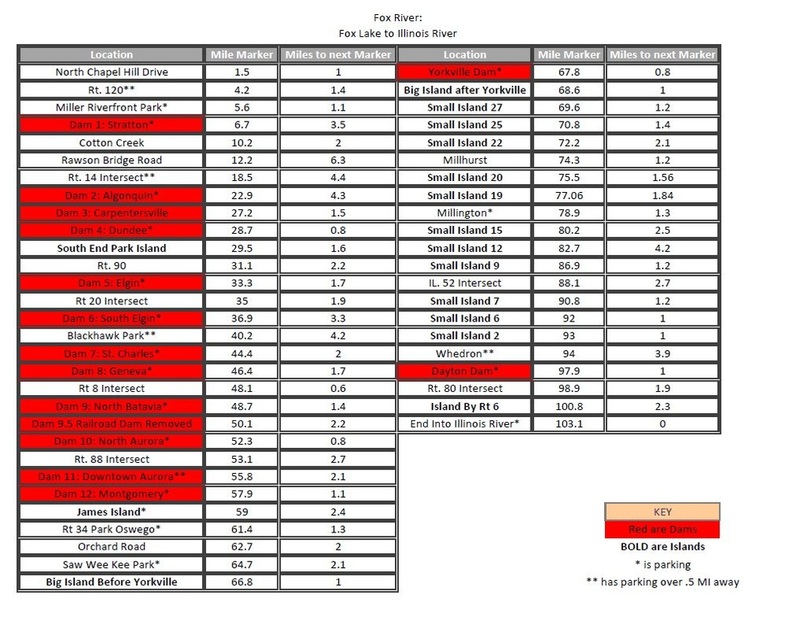 -The fox river has plenty of parking access/put ins/take outs, the most out of all area rivers, making it easy to get in and out. -There are over 15 dams to portage, and many islands. Most of these portages are short and simple. - The southern dells area feeds into the Illinois river at Ottawa. No need to portage. 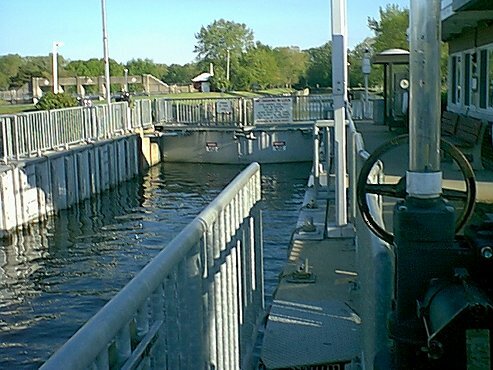 Lock operates for all powered, sail driven or paddle propelled canoes, kayak... even float tubes at no charge. 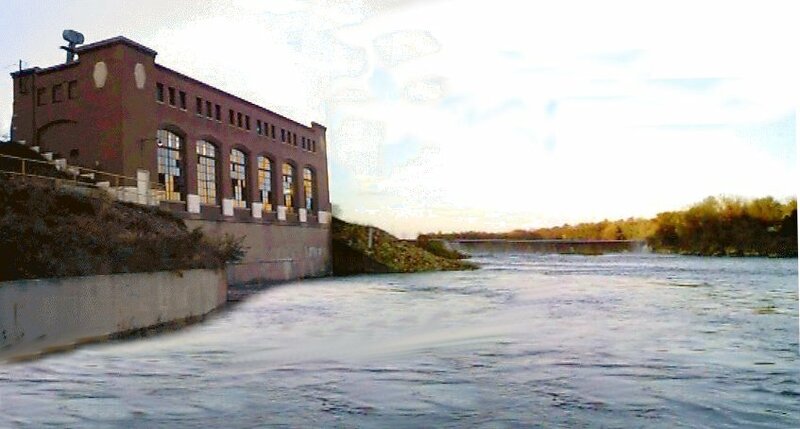 The dam is just past the Chicago Street (Route 62) bridge. Move over to river left BEFORE bridge, take out just before bridge and carry down past dam and continue your trip. Watch horizon line of dam or small gazebo type building at dam on river right in case you miss the warning sign on river right. Move to river right and cross the earth berm away from the dam. Located just after Kimball Street bridge in Elgin. Not an easy portage. Just north of the State Street Bridge, in the town of South Elgin. Portage over earth berm on river right. 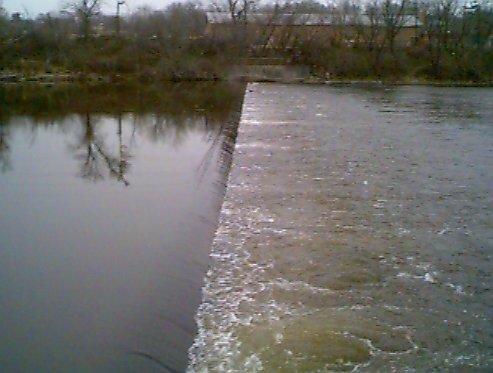 Downstream of dam has a 2-3 foot cement wall along the water with a cement ledge at the low water mark. There is a easy place to step down after crossing berm just after the dam. Just north of Illinois 64. There are stairs river left and to the right far before the dam. You'll need to walk over city streets for 3 blocks before the walls drop down enough to put back in. Portage river left onto bike path around the dam. Cross over 38, and it's an easy put in. There are gravel trails on river right for portage. River left has a broken section being used by kayakers to play in. Scout first and don't play alone! Portage river left (before concrete pier, longer walk, lower bank, after concrete shorter walk, steeper bank) onto bike trail and continue straight when bike path turns and dirt trail leads to bottom of the dam. Portage river left through parkway area 291. Riverboat area, There is a canoe chute, but it is boarded up. Take out near the chute and carry down the concrete path which follows the chute down to rivers edge past the chute. Tough portage: Take the small strip of grass next to flood wall. Hold painter line and let boat over dam while you walk along edge. There is no other way to portage this without walking for blocks. 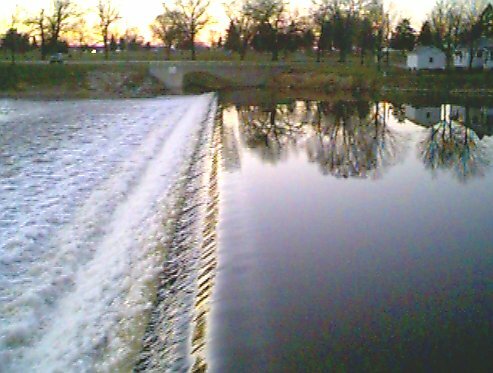 An strip of land separates the section with the dam and a section with an earth berm, little current and a small sluice gate. If you go river left into the earth berm section you can portage straight across the berm end without problem at the gauging station. Go left at the divider! Just east of the Main Street Bridge. 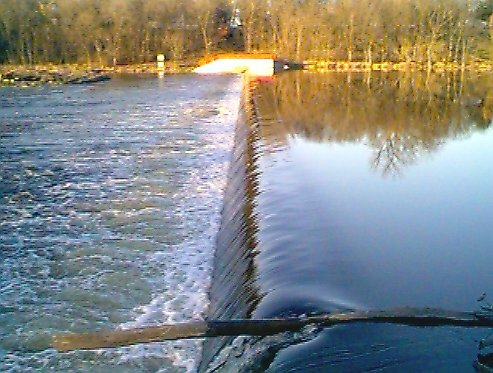 The dam creates an unusual trough sometimes at its base and has claimed more than 13 lives, use extreme care if wading near this dam. Easy portage on the river left through city park. There is a small white water course, which can be used instead of portaging. 1/2 mile north of Dayton Road Bridge We have been told there is a new portage but we haven't been back to the site yet, scout by car first Portage river left just as stated on upstream warning sign. 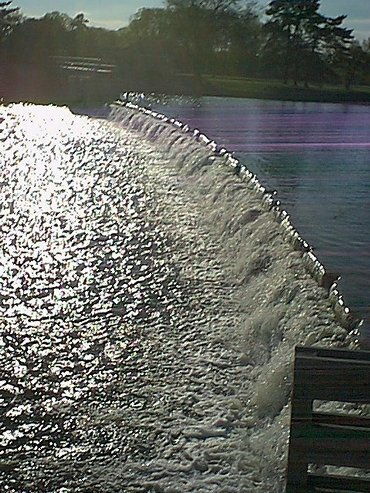 Beware of river right sluice gate which runs through power generator!